Teachers interested in applying need to complete an application and submit with requested information by January 18, 2019. The invitational leadership institute is at the core of the NWP’s model of “teachers teaching teachers.” The institute develops teachers as leaders, teachers as learners, and teachers as writers. During each institute, teacher participants examine the most pressing issues related to the teaching and learning of writing across the curriculum. Participants demonstrate and reflect on their own best practices and strategies, and they study current research in the field. Our leadership team is dedicated to fostering an interdisciplinary community and support system of teachers from all grade levels and across the curriculum. 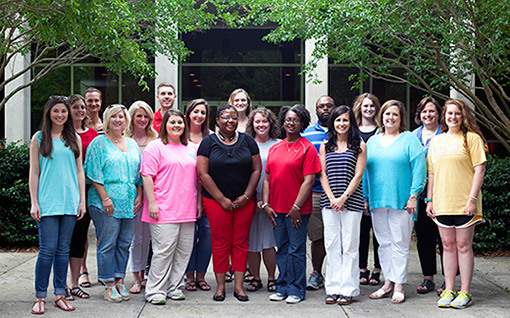 Teachers in all grade levels and all subject areas in north Mississippi schools are eligible to apply for admission to the UMWP Invitational Leadership Institute. 2016 UM Writing Project Fellows include (FRONT L to R): Mary Coker of Blue Springs, Paige Whitten of Batesville, Amanda Moore of Baldwyn, Gennella Graham of Corinth, Wendy Sharp of Olive Branch, Kerri Case of Oxford, Kim Bridges of Olive Branch and Lauren Stanford of New Albany. (MIDDLE L to R) Leigh Anne Eaton of Nettleton, Jessica Easley of Vardaman, Katelyn Sappington and Brandi Coope both of New Albany, Devan Tate of Booneville and UM Writing Project Director Ellen Shelton of Oxford. (BACK L to R) Tamara Warhol of Oxford, Josh Green of Hernando, Jamie Glenn of Guntown and Megan Garner of Tupelo.